So finally, a week to the wedding day, I had sturdy plastic boxes – 1 for each cake for the 120 mile journey to the wedding venue. 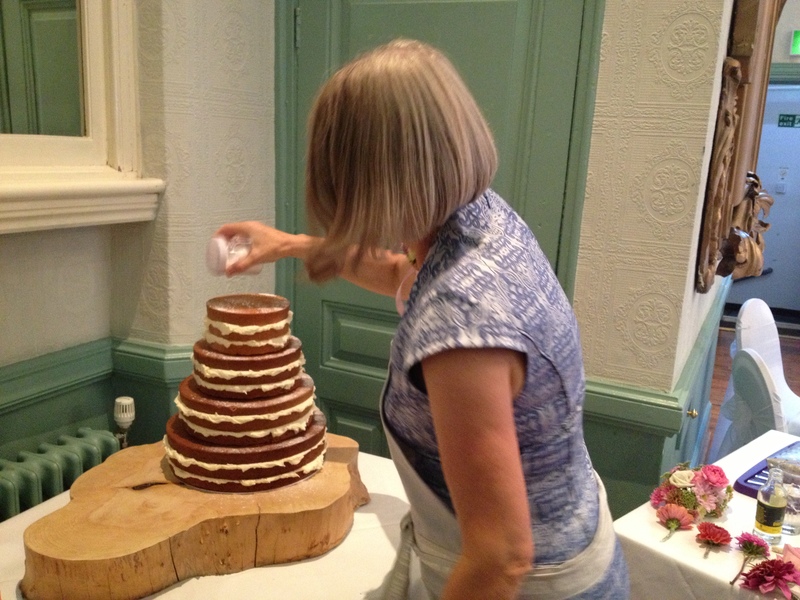 I had cardboard cake boxes to go inside the plastic boxes, I had bubble wrap and I had a lovely new apron to wear when constructing the cake at the venue. 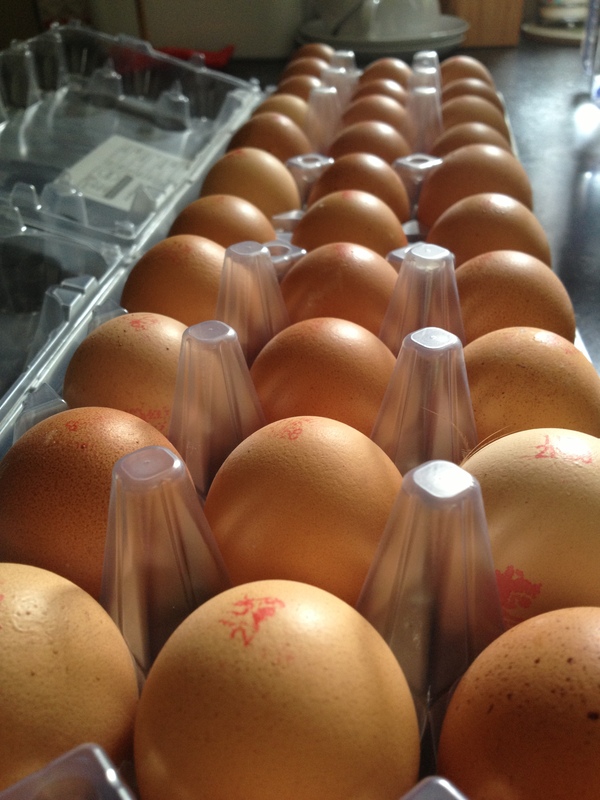 I also had 2kg butter, 2kg caster sugar, 2.7kg flour and 32 eggs – all raring to go. I had taken the week off of work, so I planned to start baking on Wednesday. 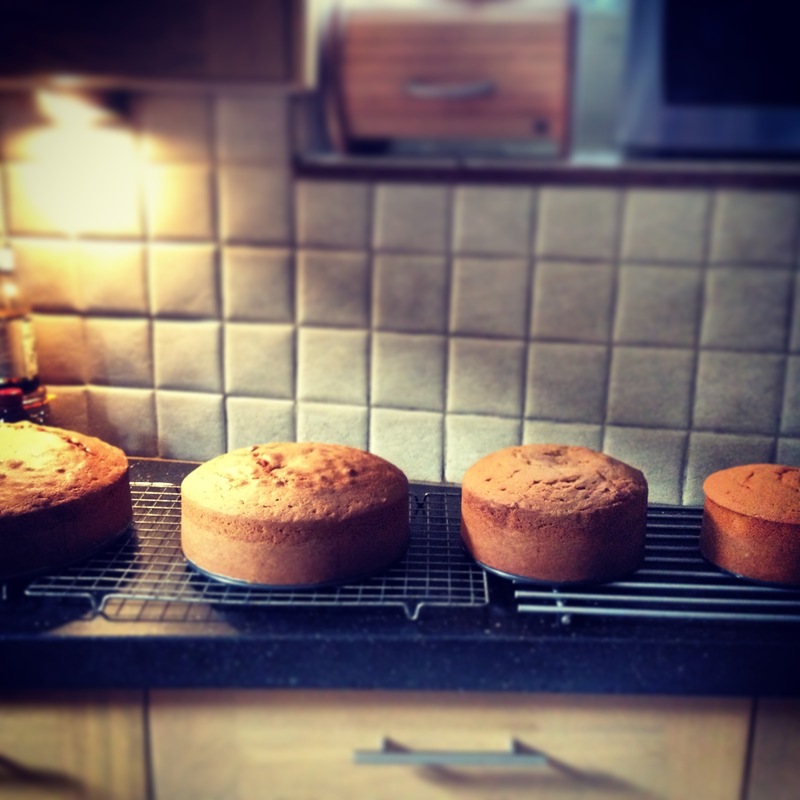 I made the two larger cakes on Wednesday and the two smaller cakes on Thursday morning. 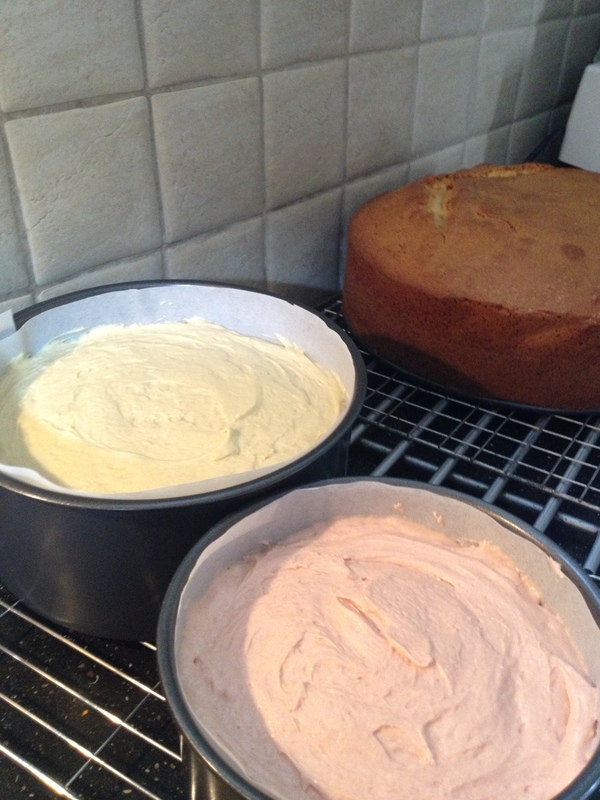 No problems, all went to plan and by Thursday afternoon I was ready to fill the cakes with the butter cream. 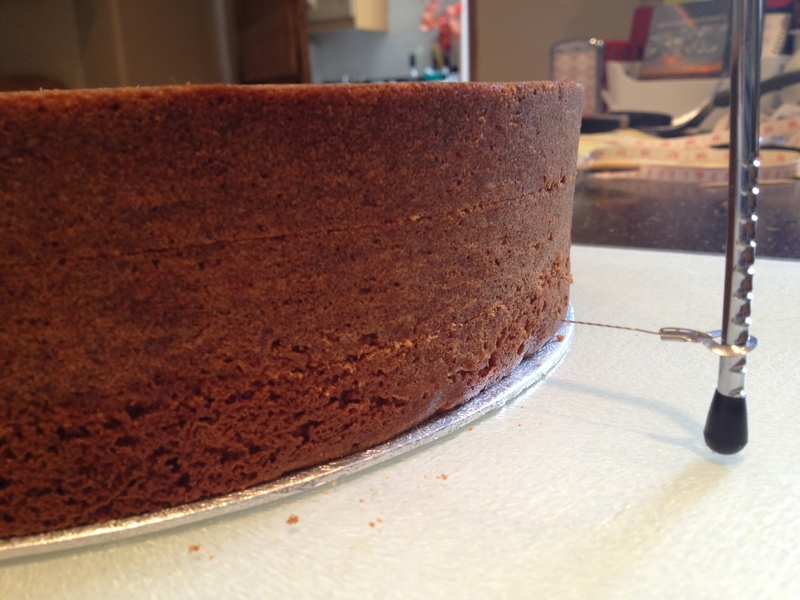 I carefully measured each cake and sliced off the top to make each tier roughly the same depth. This left some tasty offcuts to have with a nice cup of Rooibos! Unfortunately I think this is where I put on a few pounds last summer! Once the cakes were sliced it was important to try to put them back together so that each layer lined up. The tip I found for doing this was to stick cocktail sticks in a line down the side, one stick in each layer – then line these up again when the cakes are re-stacked. So I made a bucket load of buttercream, sliced all the cakes and reconstructed them once filled with their very sweet but tasty filling. I then placed them all on their cake boards and carefully measured the dowels needed for the bottom three tiers. One of the effects we wanted with this cake was to have the buttercream oozing out of the sides. I didn’t want this to get squashed while the cakes were in transit, so I put each one into a cardboard cake box then put these boxes inside of sturdy plastic boxes, packed in carefully with bubble wrap! Probably overkill but I wasn’t taking any chances. Now I could spend an hour or two concentrating on preparing to be ‘mother of the groom’. But still in the back of my mind were the logistics surrounding the building of the cake. I knew how to do it and by now I was well practiced, but I didn’t want to let anyone down, and it had to look good. The day before the wedding – everything packed into the van. We had all the cakes and associated equipment plus all the photography gear and all the photobooth paraphernalia. Plus suits and dresses for 5 people plus two nights overnight bags. We had hired a very large van, and I was very pleased that we had! Once its done its done! Top tier ready for transit! The hotel were very accommodating and found a safe storage area for the cakes in their cold room. I was happy to leave them and go off and enjoy some pre wedding festivities. I was unable build the cake prior to the wedding, not even the night before. (Well I could have built it the night before I suppose, but then I would have to be sure enough of the construction and trusting enough to allow someone to carry/wheel the cake into the room, fully tiered up) – this was definitely not going to happen! The cake was to be displayed on a table in the same room that the ceremony was to be held and apparently the law says that you cannot have food in the room during the ceremony(?! 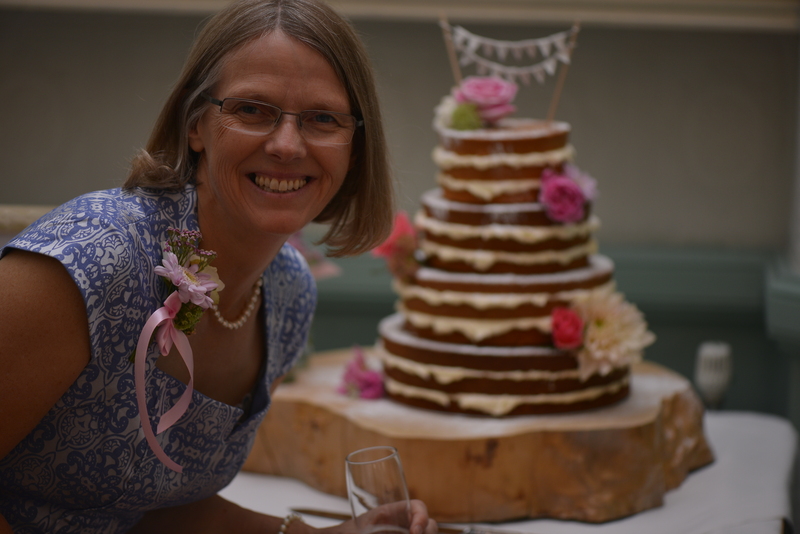 ), so between the ceremony and the wedding breakfast, and after the official photographs outside, I had to construct the cake. No pressure. I had two very trusty dear friends to help me, Caroline and Lynn. Basically they were at my beck and call and did not complain once! I was even supplied with G and T for which, by now, I was extremely grateful. They helped with keeping back the crowds of interested onlookers and kept up the praise telling me how wonderful the cake was looking and how well I was doing – thanks girls for that, it was a great boost to my confidence. Sprinkling the icing sugar was most important and I had to keep my concentration so as to not over do it! The flowers that had been supplied weren’t exactly arranged how we wanted them, so we had to deconstruct several posies and re-wire and cling film the individual flowers before pushing them into the cake. 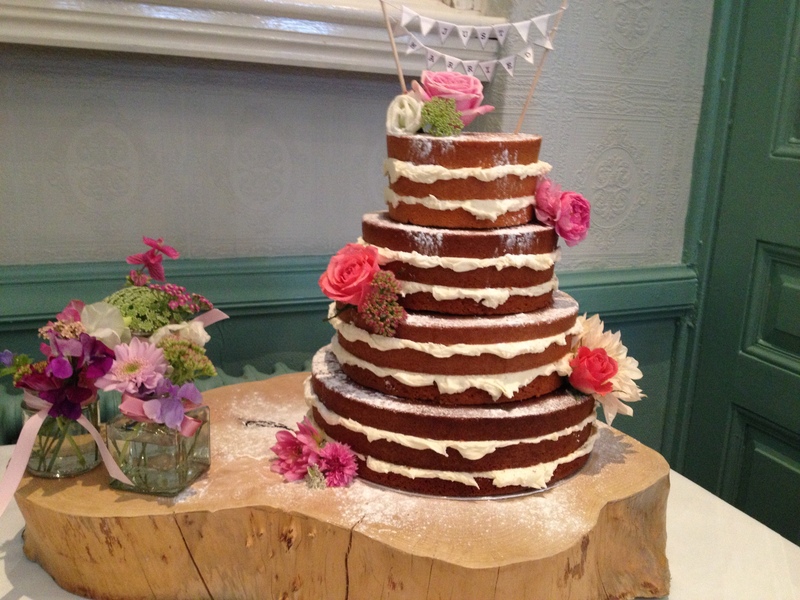 Finally the ‘just married’ flags could be pushed onto the top tier and the cake was done. I could now relax and enjoy the rest of the day with nothing else to worry about. 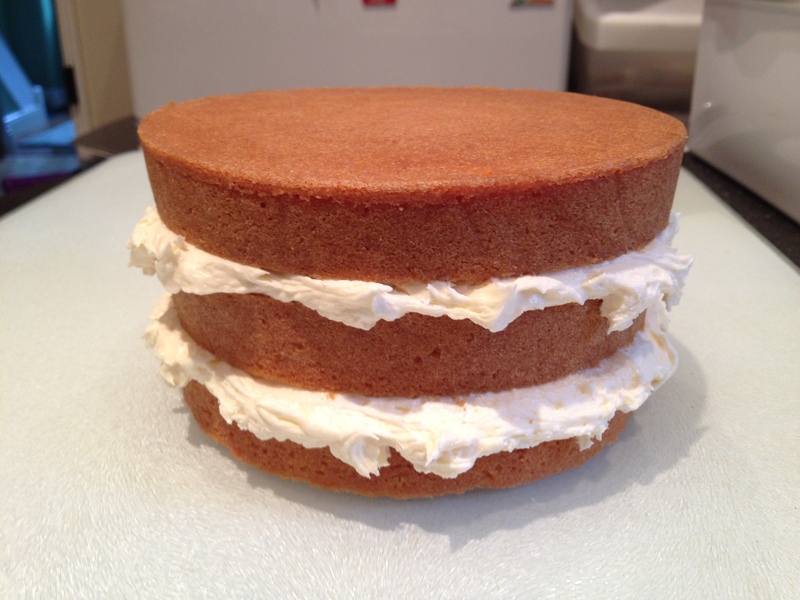 If you would like to build a cake like this or something similar, click this link for the recipe. Good luck. Please contact me for any tips/advice. Fantastic Ann it really was a stunning cake! Well done and thank you so much for all your hard work!